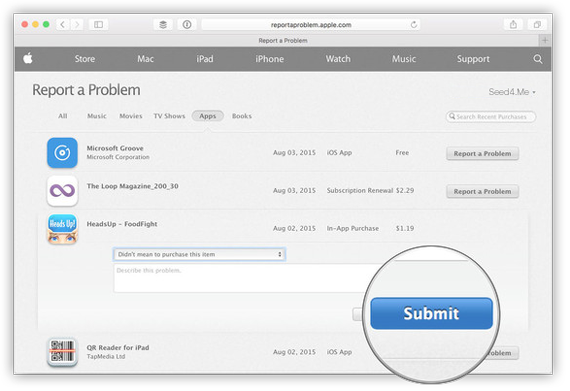 If you are not at your computer, or simply prefer to sidestep refund via iTunes, you can still request a refund using any web browser (e.g. Safari). 1. 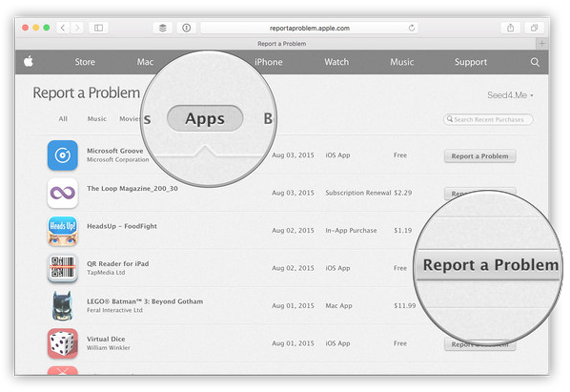 Go to Apple’s problem reports page: reportaproblem.apple.com. 2. 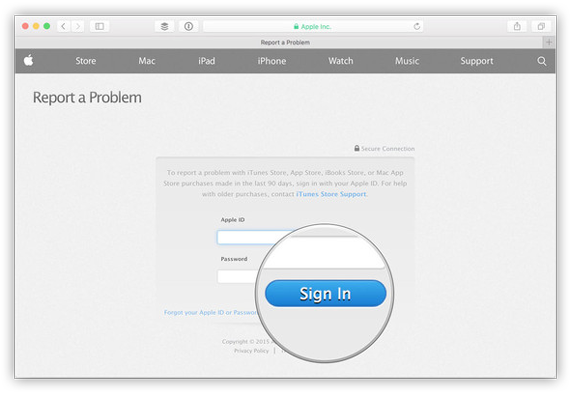 Login with your Apple ID user name (typically your email address) and password. 3. Select the appropriate tab — all, music, movies, TV shows, apps, or books. 4. Find the purchase you want refunded. 5. 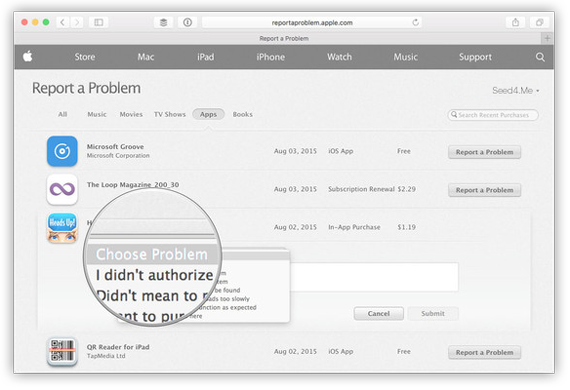 Select Report a Problem to the right of the purchase. 6. Select the reason you want the refund. 7. Fill in the description, as appropriate. iTunes and App Store refunds typically take a day or two to process and you might get contacted by Apple support to verify the reason for the request. I have learn some excellent stuff here. Definitely worth bookmarking for revisiting. I wonder how a lot attempt you put to create the sort of great informative web site. Hello, you used to write magnificent, but the last several posts have been kinda boring. I miss your super writings. Past few posts are just a little bit out of track! come on! I do believe all the ideas you’ve offered to your post. They are really convincing and can certainly work. Still, the posts are too brief for starters. May you please prolong them a little from subsequent time? Thank you for the post. I truly wanted to post a small remark in order to express gratitude to you for some of the great steps you are sharing at this website. My time-consuming internet lookup has finally been recognized with awesome details to go over with my close friends. I would claim that we readers actually are very lucky to exist in a magnificent community with so many awesome professionals with useful things. I feel truly fortunate to have come across the weblog and look forward to plenty of more pleasurable times reading here. Thank you once more for a lot of things. Hi, I check your new stuff regularly. Your story-telling style is awesome, keep doing what you’re doing! Thanks for the sensible critique. I’m very glad to see such great info being shared freely out there. Hi there to every, because I am truly eager of reading this blog post to be updated daily. It carries fastidious material. I have learn a few just right stuff here. Definitely value bookmarking for revisiting. I surprise how a lot effort you place to make the sort of great informative site. Thank you, I’ve recently been searching for information about this topic for a while and yours is the best I’ve found out till now. However, what in regards to the conclusion? Are you sure about the source? It is the official Apple’s guide, and we also tested all the steps. Thanks for your interest, you can find more in out Blog.